When Noah was born one my many fears was that my wife and I were left to this world of Down syndrome all alone. (Well, not really alone. God was well aware of and very active in what we were going through. After all He knew about Noah’s extra chromosome well before we did.) We had lots of friends who had children, but none (at the time) who had children with Down syndrome. And now we were that family. All of our friends told us they understood, but they couldn’t really understand. While we were thankful to have such a wonderful group of friends, the thought of not having anyone in our life that could really understand what we were going through saddened me. After all, our life was going to be so different from theirs. Right? It was going to be so hard to find things that our family had in common with other families. Right? It turns out I was wrong on both accounts. In fact I learned some valuable lessons about parenting in the first few months after Noah was born. You may (or may not) have a child with born with Down syndrome, but I think these two lessons are useful to any parent. 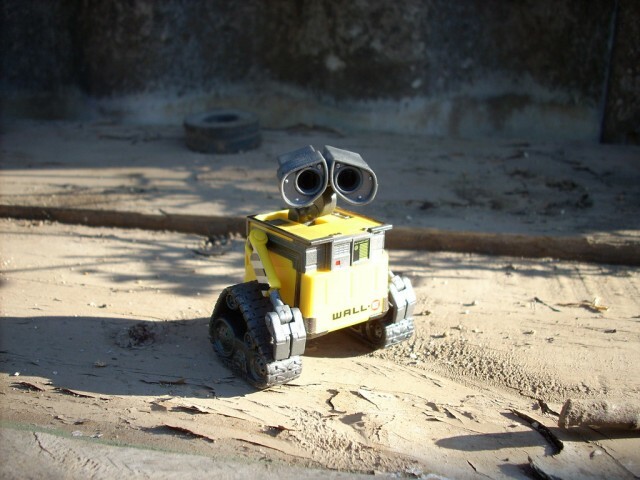 There's no need to be sad like Wall-E! Shortly after brining Noah home from the hospital we got linked up with a couple (Joel and Emily) whose middle son, Seth, was born with Down syndrome. (No offense to any of you with a 3 year old, but Seth was seriously the cutest 3 year old we had ever seen! ) We spoke over email, Facebook, telephone, and text message and quickly became close friends. Several months later we took Noah on his first vacation down to Houston so we could all hang out. I’ll never forget how they treated us like we were part of their family. I’ll be honest, there were tears that day. My wife and I had a lot of emotions, and it was good to cry with someone who really understood what we were going through. In fact as I was writing this I realized something; that was the last time I cried as it relates to Noah and his Down syndrome diagnosis. That also happened to be the first family that we had been around since Noah was born who could honestly say, “I understand.” Hmmm..maybe there’s something to that. You aren't a family of Stromtroppers! After getting to know Joel and Emily (and about a thousand other families) I quickly realized our family wasn’t all that different than a typical family. Sure we may go to a few more therapy appointments than a typical family. We may met our medical deductible quicker than a typical family. We may have to go to more parent teacher conferences then a typical family. (If you don’t have a child with Down syndrome I’m sorry, that’s sort of an inside joke!) And we may be much more sensitive to the “R word” than a typical family. But the truth of the matter is we have much more in common with a typical family than I initially assumed. If you’re a new parent, and you were hoping having a child with Down syndrome automatically qualified you to be the strangest couple in your neighborhood, I’m sorry to disappoint you. You’re still going to have to wake up at all hours of the night to feed your crying baby. You’re still going to have to change diapers (yes, kids with Down syndrome poop and pee just like typical babies…Gasp!) You’re even still going to have to give him baths….yes, like with real water! Don’t worry, contrary to what you may read on the internet, they won’t melt…! Sorry, but you'll still have to feed your baby in the middle of dinner. Never expose him to bright light. And the most important thing, the one thing you must never forget: no matter how much he cries, no matter how much he begs…never, never feed him after midnight. Turns out that once again my initial assumption was wrong. 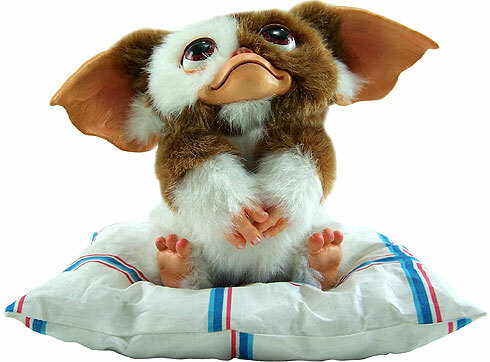 You have a baby, not a mogwai! best. paragraph. ever. thanks for making me laugh out loud today. Ha,ha..I’m glad you liked it! As a youth communicator I (sort of) speak for a living. When you speak orally it’s fairly easy to express humor and sarcasm. In a blog like this I try to write the way I would speak if we were all in a room together. However I loose tone of voice, body language, and many other advantages spoken word has over written. So I worry if our readers can discern all of my *personality* in the context of a blog like this. Comments like yours give me encouragement! 🙂 So thank you. Do you have a child with special needs? How did you find our blog? lmbo… same here!!! Our family tends to get a lot of looks and I am content with knowing it has NOTHING to do with my son having Down syndrome.. and everything to do with our craziness!!! I will say though, that although we have come a long way in terms of social acceptance, there is, a lot to be worked on… I notice people either staring too hard(which I don’t mind as much of but wish people would approach us) or afraid to stare at all (which kind of bothers me!) at my Michael. No, my Michael having DS does not make us weird, but it does make us different.. and different in a way that is both obvious and to many, confusing. Yes, I was completely freaked out about being “that family” in the beginning.. and finding out that your child really isn’t that different can be both rewarding and disappointing (I had a “wait, you mean to tell me he’s experiencing terrible two’s??? He cant be, he has Down syndrome” moment a while back… lol). In the end, it’s a beautiful thing to be a parent of a child with (and without) Down syndrome and I wish everyone had the opportunity to experience the feelings and emotions that go along with having a child with Down syndrome. As I tell everyone- no one “asks” for their child to be born with Down syndrome… but having a child with DS has to be one of the greatest experiences in the world of parenthood…. Keep doing what your doing mom and dad… and and behalf of my very own son and the DS community, thanks for advocating- you have made such a difference in the lives of so many… I know you will continue to do so! Thanks so much for your comment Lisa! I just checked out your blog and you guys are doing a GREAT JOB! Be sure to tell Tommy Noah and I are proud of him also! We are glad you have connected with us, and are so glad to be on this journey with you. If we can ever do anything for you, please hit that contact link above. We look forward to staying connected with you. I sure am enjoying your blog! When we found out we were pregnant I was 41. I was blessed by extra tests because of my age. When it came to Trisomy 21, we had a 50/50 chance. Having 5 other children, we wanted to know whose life we would be celebrating, so we ordered an amniocentises. I have to tell you, God had sooo prepared my heart. So much so that the entire time I was waiting for the results, I was literally talking myself “down” to a typical baby. The nigt of the test we were out to eat and a couple w/ a bay who had Down syndrome were seated behind us. My heart yearned for that child. When the tests came back positive, I celebrated, my family celebrated, my friends celebrated. There have only been moments when I realize the limitations Jillian will have. They are ALWAYS followed by epiphanies of what she can do. As for being “that” family! I am sure you have had the same experience we have, we are now a part of a bigger family, part of a “club” you can only get into if you are blessed by God with an extra chromosome 21. Thanks for your comment Cindy. That’s such encouraging her story. Have you “liked” our Facebook page? We’d love for you to put up a picture of your kid-o on there! We are glad to be on this journey with you. Let us know if we can help in any way, and keep us posted on how things are going! i also have a granddaughter with downs, felt so many emotions at first, she is now 9 and is the light of my lfe, so much love, she is a wonderful little girl and I can’t imagine life any other way. That’s so awesome! Thanks for sharing, I’m sure she’s a doll. My husband and I have joked about Cora being a Gremlin too, based on others’ expectations of what her life is like. Although I think that may have started with our desire to not have to feed her after midnight! Excellent blog. I especially loved your inside joke. How true it is. Its so nice to know others realize how truely blessed we are. My dad asked me the other day how often I get bummed out having a daughter with special needs. I took one look at her and said, ‘Never’. And I meant it. I can’t or wouldn’t want to imagine life without my little angel. Bless you all. My biggest fear was would the nursery we had in mind be able to have her attend. They were very quick to say of course they could and they have really gone out of their way to help Lauren and us. Our portage worker goes there twice month, they are learning makaton and they paid for the Down Syndrome Association to go in and educate ALL the staff as to how best they can help Lauren. All my fears completely sorted here. I do still have worry pangs about the future but if we work hard to help her overcome life’s little hurdles today that will take care of itself too. She drank from her bottle on her own yesterday at 20 months. That is so awesome! It sounds like you guys have a GREAT nursery. Where are you and your family from? Also what is a “portage” worker? I’m not filimler with that term…. You can read about “portage” workers on this web page. Right on brother. Joel and Emily love that little Noah! A few years ago, a friend of mine who was a new Mom called me with a concern. Her child was constantly banging his head on the high chair. I told her, “Oh, don’t worry, Teresa did the same thing when she was his age.” I hung up the phone and chuckled out loud as I realized I had just reassured my friend that the behavior her child was exhibiting was perfectly normal because my child with Down syndrome did the same. I wonder how much comfort that could have brought that poor nervous mother! But, at the time of our conversation, it didn’t even cross my mind that I would worry her, because to me, everything Teresa does is just part of the “normal” big picture of life with her — a wonderful, yes at times challenging, and often gloriously unusual, blessed life! I read that out loud to my wife, and we were both laughing. I felt the exact same way when Owen was born in 2009. Would we ever make friends with typical people? The answer was YES and quickly! We have a great circle of friends and found some more at our local therapy center. It’s nice having people around that don’t treat Owen like he’s a science experiment or that they might catch Ds from him. Our kiddos are amazing–the obstacles they overcome, the challenges they face. I am continually amazed at what babies, kids, adults with Ds CAN do! If that is your son, thanks for posting! He is adorable! Noah’s dad we’re from Wales in the UK. Portage is a home-visiting educational service for pre-school children with additional support needs.Apparenrlty it is named after the town of Portage in Wisconsin, USA. It was developed there as a way of supporting parents in helping their children in their own homes. Thanks for educating me Karin! I enjoying learning about the special needs communities in other countries! YUP!! We were the same way! Belle is 15 months old now and we really think that the added Chromosome makes her the Most normal kid out of all of us! Including me and her father! Congrats on your bundle of Joy! So awesome! Thanks for posting. Where are you guys from? The pictures of your girl are adorable! Great blog. We do feel like we are the only ones down here in Key West. We heard in the entire Florida Keys there are only 7 families with a person (not child) with DS. So in that sense we do feel alone (except of course, for God, who we always trust). Your blog and Facebook has connected us with families in our situation and we so appreciate it. We truly love the fact that Noah is so close in age to Enzo and that is a plus. We are thinking about even visiting the next National Down Syndrome Conference or whatever it is called in DC next year just so we can meet other families and start connecting. There are tons of options and we are looking into all of it. Thanks for posting. WE appreciate it! I’ve always maintained that raising a child with DS is almost identical to raising any other child. Every kid we have has their own set of special needs and considerations and strategies that work and don’t. As parents we adapt to the needs of our kids, whatever those needs might be. We might have to deal with a society that doesn’t understand, but we are far less likely to worry about our child turning into a crack dealer or a politician. When I started my blog, my daughter’s DS featured more prominently, and I sought out other DS parenting blogs. But as time went on, my daughter’s DS got mentioned less and less – basically it’s very rarely an issue any more. Most of the posts I write about Meg are just father-daughter posts and the DS is irrelevant. Thanks for your post, and for you blog post on Squidoo. I hope you guys are doing well! In the past year I’ve heard countless stories about dads who have simply gave up on their families. It breaks my heart. I’m thankful to hear from another dad who loves his kids and his family! Hi, just found your blog through Pinterest. Have read some posts here and there and really like it, and your boy is SO cute! We have a 4 month old girl with DS, she is our third daughter. We found out 3 months into the pregnancy that she had DS, and my big fear was that ‘everything’ would change and that we would be spending all our time worrying, at the doctor’s, therapy, etc. Well, I can say that that didn’t happen. Yes, we have some health issues and have therapists coming to our home, but compared to having this sweet little girl, it suddenly means nothing. It has been great to see how nice our family and friends reacted, after they learned that we were having a baby with DS. And we have met so many nice families who have a child with DS. If I knew back when we found out about her diagnosis what we know now, I would have felt SO much better! Thanks for leaving this post..I’m sorry I’m just now replying..I’m not sure what happened. How is your daughter doing now? I hope you guys had a great Christmas. Also it’s great to hear how your family responded to the surprising news. Such a blessing. Glad you are posting some of your “classics”. It’s the most likely way I’ll read them 😉 Fear is such a powerful emotion. Your lack of fear in sharing your family’s journey is having such an impact dispelling the myriad of unfounded fears of raising a chid with Down syndrome. It’s been so gratifying to watch this community grow! I am loving this – laughing and smiling. One of my biggest fears is that other people would feel awkward and that the Princess might not get the attention that her brother does (he is exceptionally handsome and we get stopped a lot for someone to comment on his eyes). Boy, was I ever WAY off base. She is beautiful. I get stopped all the time for people to tell me so plus her propensity for waving and saying “hi” like she’s in a parade also gets her lots of attention. I can count on one hand the number of people who have had an awkward moment but it’s short-lived. You’re right – we’re not THAT family to everyone who knows us. We’re just “the Loftens” and I wouldn’t have it any other way. We are already far from the “typical” family. 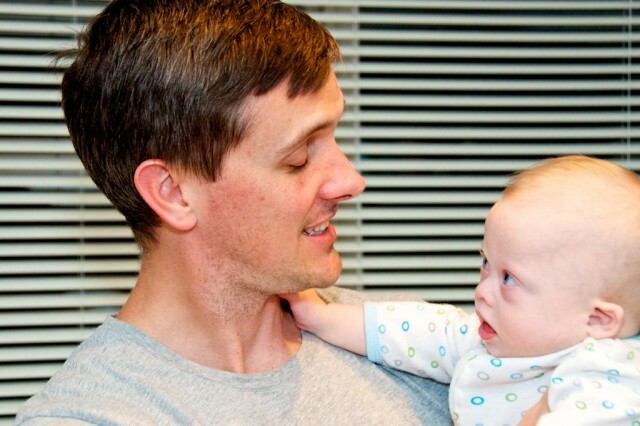 My husband is blind, and we had 7 children, when my 8th child was born with Down Syndrome. Kara is now 16 months old. I had a million worries and fears, but one really stands out to me. I was so afraid to take her home. How would I know what to do, how to do it, or what will she need. I felt like I did when I took my first child home…clueless and helpless. When I said this to my pediatrician, he had a great response. He said, “You just take her home and love and raise her just like you did all your other children.” I remember thinking, “but’s it not that simple!” The truth is….it really is just that simple. Therapy and Dr appts are a new addition to my schedule, but I can work with that when she is such a wonderful blessing to me. I am now pregnant with my 9th child. While I don’t wish for DS for my new baby, it no longer has the fears for me that it once did. I remember sitting in Bible Study very soon after James was born, and the leader asked us something about our kids’ futures–where we saw them in 10 years, or maybe it was our hopes and fears for our own future…. I don’t quite remember, but I remember very vividly thinking, “I am so different. All of these people have hopes of their kids leaving home, going to college, getting married, and I will still be raising my adult son!” It really hit me that day how different my life had become. Yet, the more I learn, the more I realize that those fears are most likely unfounded! Sure, they could still happen, but there are many people with Down syndrome who are leaving home, going to college, and getting married! I had no idea! And you know…every family has a different story. Before James, my story was different because I was a minister’s kid, married to a minister, from the big city, living in a small town. That automatically set me apart. The experiences in our lives–be they the places we travel, the occupations we choose, or the children we have–make us all different. But different doesn’t mean alone. Oh, and this post cracked me up. “Your son has two arms?” Hahaha! 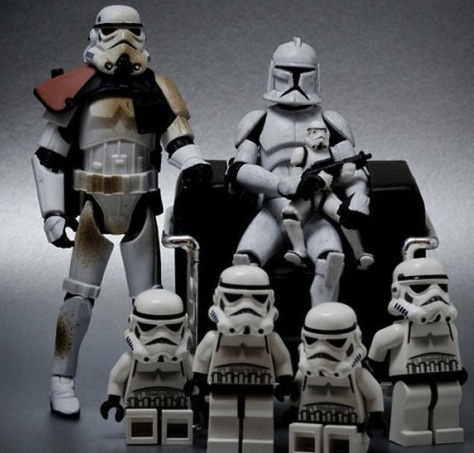 And a storm trooper baby…and the weird families…and Wall-E. Too funny. I love to see another parent obsessed with their baby too. We were so lucky to have a local support group meet with us in the hospital just a day after she was born. That turned it around for my husband. My daughter turned it around for me the first time I held her. Ahh aren’t these babies the best. 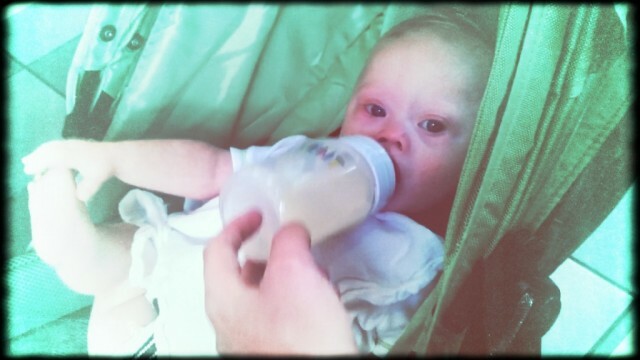 Noah’s adorable, I love his blue eyes! This is an awesome post, and I have shared it on my Facebook page because I want to raise awareness among my friends about what you are doing. Following Noah’s story since I first followed a link to your blog about the Target ad has been a real blessing to me, even though I do not have a child with DS. I believe that your blog can do a lot more than help other parents who have fears about raising children with DS; it can help people who have fears about interacting with people they encounter who have DS or other special needs. Thank you for sharing so openly about your precious son. He is indeed a blessing and has a unique, God-given purpose in this world, and Down Syndrome is one of the gifts through which that purpose will be fulfilled. I cannot stop giggling about families who are weird are just weird, because it is SO TRUE! It doesn’t matter who your children are, or who their children are, they were just going to be weird, no matter what. I laughed all the way through this! Thanks Rick, I totally have felt all these things at some point in the past 4.5 months! Okay I loved this!! I love your sense of humor!! I really needed this blog tonight!! I am keeping my fingers crossed I am not one of the “weird” families now! HAHA!!! Thanks everyone for the kind words. You are all so great! I love that you shared this. As a teacher of students who have challenges, I always strive to talk about the cans and wills not the can’ts. Love how dad, mom and Noah started out positive on this journey. Loved this and the humor for sure I pride myself in my warped sence of humor and truely enjoy someone elses as well. 1st thing I feared was the death of my baby Her heart specialist was so HEARTLESS Was told she would be lucky to make it to 12 SHE IS 31 THANK YOU VERY MUCH !! TAKE THAT !!! Was also told that she would cause much confussion and pain for her sibling WELL he has grown into one of the most thoughtful , understanding , compassionate ,responsible young men I have ever known and I think Cathy had a great role in that So wrong again MR Heartless Heart specialist ! I love this for two reasons number 1. I was worried about my sister’s baby and her future struggles (which I now realize is needless) 2. My husband and I suffer complete infertility. (we only had one miscarriage and no other pregnancies) all the years we went childless we felt like that “weird” couple and it was lonely very lonely! !” no one knew how to approach us because we also had 7 deadend adoptions and I had 10 surgeries in 10 yrs. All in an effort to have kids. We Kept our close friends but didn’t make new ones. Anyhow when all was lost we finally got the call that would make us parents. They weren’t downs syndrome but there were 3 all in diapers and different ethnicities even though they are half sibs. So we had the same fears. What would people think of me? Was the hardest to get over. A woman being called mom by a Mexican, African American and causation all a year apart. I told my husband we were the odd couple when we didn’t have kids now we’ll be the odd couple with kids! However, I’m happy to report we are normal by most standards. Although it makes for a great story the truth is my kids do everything all the other kids do and I’m a mom even if I didn’t get here the old fashioned way. 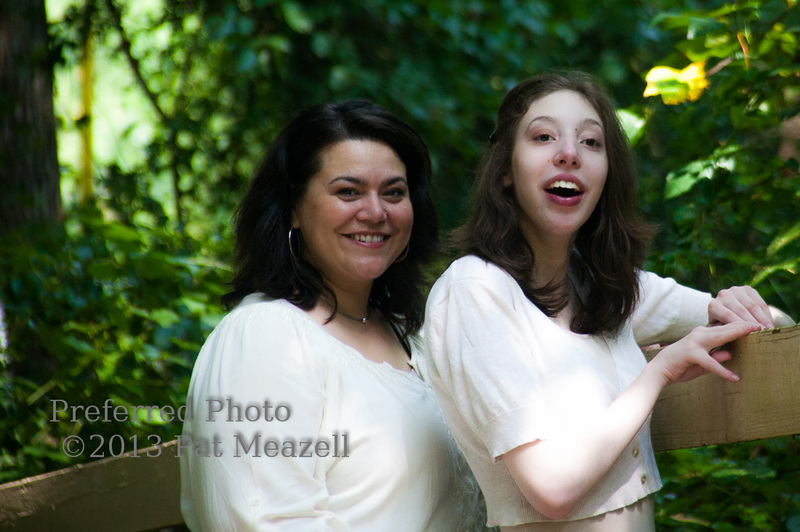 And my hope is Ava (my niece who is downs) will have a normal upbringing as well. However, I suspect you won’t find many families with a downs child and three adopted sibs that look like a meeting of the united nations very often. Perhaps being unique is a good thing. It IS a good thing! Being like everyone else is boring. Shanan, just so much <3 for your entire post! Unique IS a good thing! “Yet here I was. Strolling out of the Down’s Syndrome Guild, pushing a baby carriage with the sweetest little bundle I’ve ever met. Still struggling to come to terms with what it means to be a mother to a special needs child. And then I realized – I’m just a mom. Every one of my children has special needs. Calvin is intelligent and clever and loves for me to spend time with him. I have to keep him busy or he causes mischief. Jordan is an artist, singer and loves anything creative. She is absent-minded and would lose her head if it were not firmly attached to her body. I have to remind her every few minutes of what she is supposed to be doing. Ian lives at his Father’s house. I have to love him from a distance and rekindle his memory. Gavin is a bundle of energy and love. His hugs come kamikaze-style and often leave visible proof of his affection. I have to teach him to channel that passion in constructive ways. i love the humor u used to get the point across!!! this was an awesome post!!! and Noah??? i swear he seriously got tht cute factor down to a science!!! Nice way to laugh this morning. These are my sentiments exactly and more often than not, weird is weird and not because of DS. Thanks! I agree with most of what you wrote about but sometimes the reality is not that way. 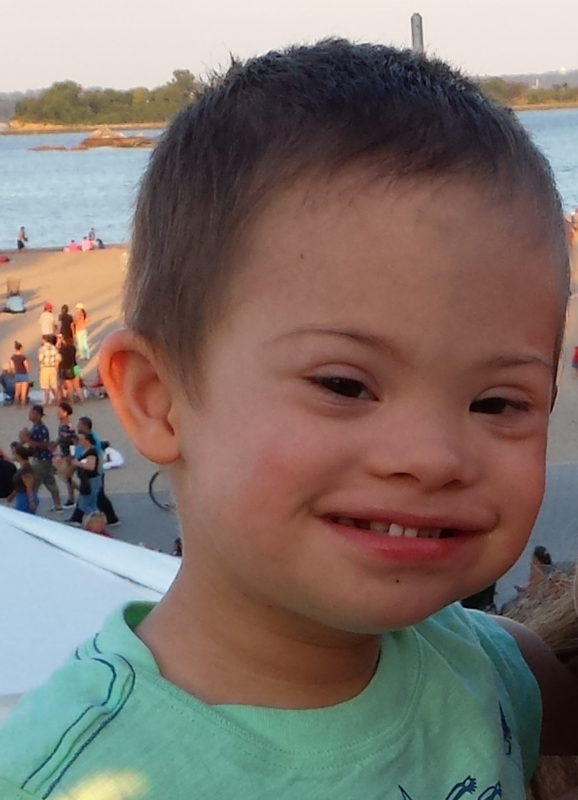 My son did not have Down syndrome. He was born with a neuronmuscular disease (SMA) that robbed him of sitting up, crawling even at somee points breathing. When talking to my friends about our days they never fully understood that Michael struggled everyday. As a result some of those friends pulled away and left, especially after he died. Love your blog! I found it through my sister who’s youngest has an extra chrosome, something she proudly brags about! My sepcial child has been adopted and gone through hell with abuse and bonding issues. I can relate to your blog because I too feel like “that” family, only on the outside my child does not look different. I sometimes think that is harder. This is the coolest post. We are still getting the hang of newborn again, forget Down Syndrome, I’m the walking Zombie. Ha! Rick, thanks for the laughs and Noah’s sweet smile. Our little one, House, is doing beautifully and such a blessing at almost 1 month old. To new(ER) parents than us, our son scared me because I thought I wouldn’t be up to the job of being a “good enough person” to deserve him. I felt this way about our older son, too. It takes a little extra time and effort to get your mind moving in the right direction, but our sons are worth all of it. Also, totally agree with the post just below. Best. Paragraph. Ever!! I just found your blog. I really enjoyed it! We are expecting our second child with Down Syndrome and I find myself asking myself the same questions all over again… not because Rowan is so different to other children but precisely because he isn’t! I find myself thinking. – but what if THIS one really is different! So I loved this post, reminding me that our children aren’t gremlins! Even though my older children tell everyone that Rowan is superhuman…. Wonderful to read – thank you! These people don’t understand that I’m a hard-working, intelligent human being yearning for acceptance just like the rest of them. They can say they understand as many times as they want, but I know they don’t. Great post! I especially like the gremlin reference! I don’t have a child with Down syndrome, but I work with kids with special needs, including children with Down syndrome, and I would actually like to adopt a child with Down syndrome some day. I know for a fact that, contrary to popular belief, kids with Down syndrome aren’t happy little angels hugging everyone every minute of the day. But from working with them I grew to love the stubbornness/ sweetness/ silliness/ mischievousness/ cleverness I saw in so many kids with DS. One year ago today we had our 12 week ultrasound and the first hint that our baby might have DS. You’ll laugh- one of the things I worried about was that he wouldn’t play with Legos! He doesn’t yet, but because he’s a baby, not because he has a bonus chromosome! And a couple of weeks ago we attended a DS conference, and I just kept thinking about how all these families were so very….normal! I LOVE FOLLOWING YOU on facebook!I am a single mother raising a 10 yr old,Diamond,who has DS.I also have a son,13,Jake,my other 3 children are grown and live in a different town.You have an awesome family!When Diamond was 3 I remember her developmental Dr, asking if I had any questions and I said I have just 1;when is Diamond going to act any differently than my other children have? ?He didn’t “get it”;but Im sure you do!………no gremlin here! !Diamond is the light of my life as well as my son who is just an awesome kid!thx for sharing your lives! Loved this! Loved the humor! Our child with DS is now a lovely young woman of 28. She has gotten to just about everything in her own time. I do wonder why puberty was advanced and not delayed. But, that’s ugly on everyone. She is a blessing to all of us and to everyone who mows her.